Bonanza garments are far famed in Pakistan due to its quality and its exclusive designs. Bonanza is a leading apparel fashion brand that in recognized for its quality products and exclusive designs. Bonanza is a old fashion brand that was founded in 1976. 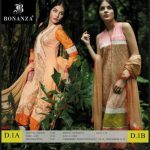 Bonanza garment included Lawn dresses, Sweaters, shirts, trousers, shalwar suit, kurta shalwar etc.Recently Bonanza garments have launched Colorful Bonanza Eid Wear Collection 2012 for Women. Like all other Bonanaza product this collection is also different from all other Pakistani fashion brands for its quality and style. These design comes with extra sleeves, embroidery, lace and borde for special Eid event. This collection include A-line kurti design, shalwar kameez with long trousers, Lawn aline shirts with little embroidery on neckline. Now do not wait and get your bonanza dress and proud to be wear Bonanza product. 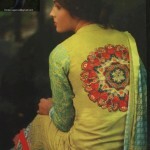 All dresses are colorful with chiffon duppatta and stylish embroidery.